Wartner Wart & Verruca Remover has been developed to offer the most effective and easy to use self-treatment available. Typically only 1 treatment is needed. Due to a new application technique, the Wartner Wart & Verruca Remover is even more effective. 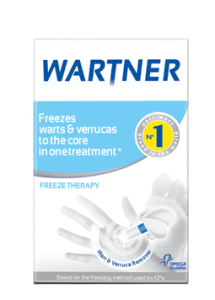 By optimisation of the freezing temperature and contact time of product on the wart/verruca, Wartner is able to deliver the required therapeutic temperature and efficacy. If the wart or verruca , or part of it, should remain two weeks after treatment, you may safely treat it a 2nd or a 3rd time. For verrucas, a file is included for optimal preparation prior to the treatment: see leaflet for additional instructions.